History: Adolescent male with scrotal pain. 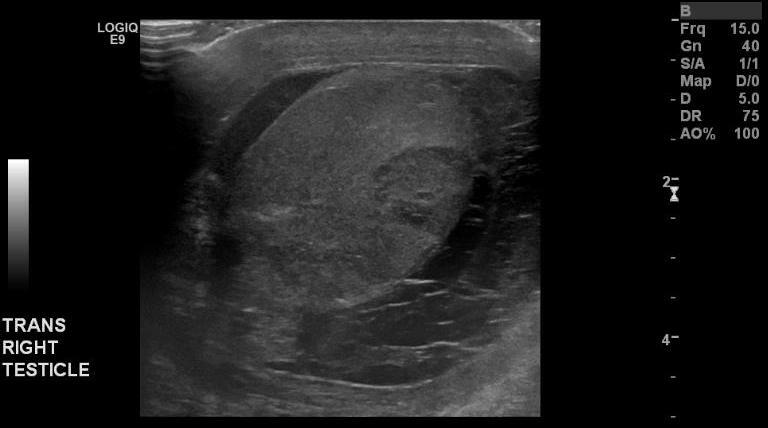 Focal Orchitis with Pyocele: Grayscale scrotal ultrasound image of the right testicle reveals a round heterogenous hypoechoic region in the right testicle, which is surrounded by fluid with echogenic debris, compatible with focal orchitis and pyocele. Focal orchitis: Doppler color ultrasound in the same patient reveals increased flow within the hypoechoic region, compatible with focal orchitis. 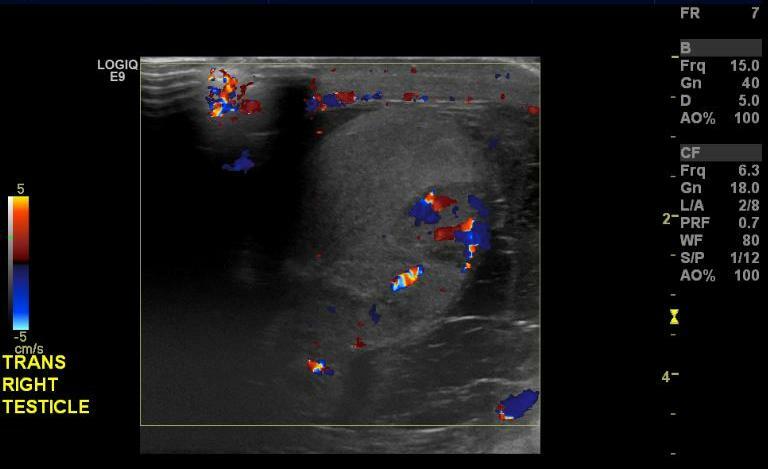 This is a case of focal orchitis with pyocele, which characteristically appears as an ill-defined hypoechoic heterogenous lesion in the testicle on grayscale ultrasound, with increased flow on color Doppler ultrasound. This is distinguished from an intratesticular abscess by having internal flow on Doppler ultrasound. Intratesticular abscess would be favored in the absence of internal flow, with increased peripheral vascularity. Focal orchitis typically is caused by genitourinary ascent of bacteria such as E. Coli (which was the etiology in this case), and chlamydia, which is more common in sexually active adults. Primary orchitis can be caused by mumps, but is exceedingly rare with the use of the MMR vaccine. A pyocele is essentially a scrotal abscess, and is a complication of orchitis. It can progress to something called Fournier’s gangrene. The differential diagnosis in this case essentially includes testicular tumors and trauma. Read about other testicular ultrasound cases and tumors here.